Chen, Y., Hsiao, Y. and Wang, C. (2015). Phenol-based Total Protein Extraction from Lily Plant Tissues. Bio-protocol 5(4): e1399. DOI: 10.21769/BioProtoc.1399. The phenol-based total protein extraction method is unique in that water-soluble components such as polyphenolic compounds and nucleic acids can be easily removed. Thus, total protein is free from contaminants and allows for high quality two–dimensional gel electrophoresis. The phenol-based extraction of total protein was used in various lily organs and may likely apply to other plants whose content of polyphenolics is high (Note 1). An additional advantage of this extraction method is that nucleic acids can be easily removed and thus, avoid adverse effects of nucleic acids on protein resolution in the gel. This method is modified from that of Hurkman and Tanaka (1986). Various vegetative and floral organs of young lily plants, including flower buds with a length around 4 cm were collected. The first three whorls of young leaves around the buds, plus the entire roots (approximately 8 cm from the apex) were also collected. Each organ was dissected from lily plants in the field and immediately frozen in liquid nitrogen and stored at -80 °C. Work in the fume hood. Add liquid nitrogen into a mortar (12.5 cm) and pestle and keep them frozen. Add and grind 1 g of fresh or frozen tissue into powder in the frozen mortar and pestle in liquid nitrogen. Keep the sample frozen at all times. Add 5 ml of water-saturated phenol and 5 ml of extraction buffer to the sample powder. Add more liquid nitrogen into the mortar for easy grinding and mixing of the plant sample. Repeat one more time. Leave the frozen sample mix in the mortar until it melts and turns into a slurry. Grind the sample mix vigorously as soon as it turns into slurry. Transfer the melting solution into a glass beaker (25 or 50 ml in volume) and gently mix with a stir bar for 30 min at room temperature. Transfer the sample mixture into a COREX® tube. Centrifuge at 10,000 rpm for 10 min at 4 °C. Transfer the upper phase (phenol phase) into a new 50 ml tube. Add an equal volume of phenol to the aqueous phase. Mix thoroughly by vigorous vortexing for 1 min. Remove and pool the upper phase (phenol phase). Add an equal volume of extraction buffer to the pooled phenol phase. Add 5x volume of 0.1 M NH4OAc in 100% MeOH (cold) and mix well by vortexing for 1 min. Precipitate protein at -20 °C for 2 h or overnight (approximately 16 h) (Note 2). The protein pellet is added with 10 ml of 0.1 M NH4OAc in 100% MeOH (cold). Wash the pellet by vigorous vortexing. Repeat the washing step twice. Add 10 ml of acetone. The pellet is shortly dried by speed vacuum for 30-60 sec. Dissolve the pellet in 300-500 μl (Note 3) of dissolving buffer and mix constantly by vortexing for 30 min. If the pellet is big, break it down into small pieces with a glass bar in order to increase protein solubility. Collect supernatant (protein). The pellet (Note 4) in the tube is redissolved in 300-500 μl of dissolving buffer. This process of protein dissolution may be repeated several times until the concentration of protein in the dissolving buffer becomes insignificant. The collected supernatant may be pooled together. Figure 1. Anther-specificity analysis of lily protein by SDS-PAGE. 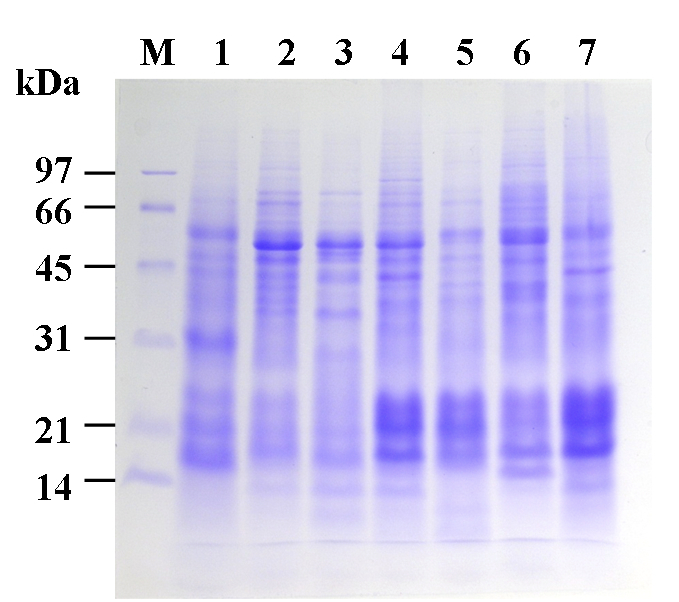 Total protein (40 μg) was isolated from various organs of L. longiflorum, separated by 12% SDS-PAGE and stained with Coomassie blue. 1, root; 2, stem; 3, leaf; 4, tepal; 5, filament; 6, anther; 7, pistil; M, marker. Figure 2. 2D-PAGE analysis of lily pollen protein. Total protein (1.5 mg) was isolated from pollen of L. longiflorum, separated by 2D-PAGE and stained with Coomassie blue. Marker proteins are indicated in the left. Then fill ddH2O up to 10 ml. ddH2O is added to a volume of 3 ml, filter-sterilized (0.22 μm), aliquoted and stored at -20 °C. In our experience, total protein extracted from various organs of Arabidopsis and Tobacco plants using the phenol-based total protein extraction method yields high quality protein. Protein precipitated at -20 °C overnight (approximately 16 h) may allow a better yield of total protein. However, if yield is not a concern, most proteins can be precipitated at -20 °C for 2 h.
It is important to maintain protein samples in a high concentration (at least 15 μg/μl) given that the maximum of sample loading in isolectric focusing of 2D-PAGE is around 100 μl. If protein is prepared for SDS-PAGE only, a larger volume of dissolving buffer can be applied. Protein in the pellet can be dissolved with the dissolving buffer. However, insoluble materials may remain in the pellet after centrifugation. The protocol is mainly modified from that of Hurkman and Tanaka (1986). We appreciate their original contribution. Hurkman, W. J. and Tanaka, C. K. (1986). 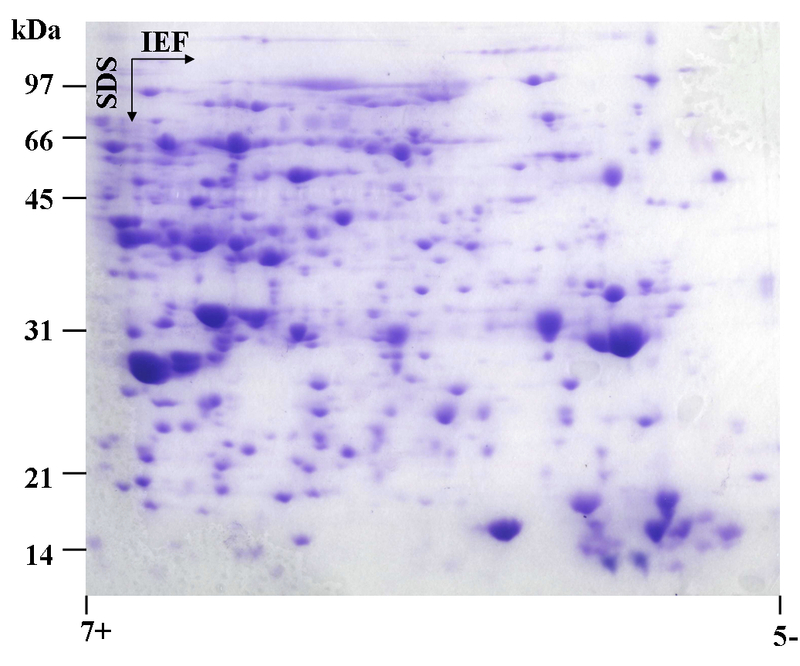 Solubilization of plant membrane proteins for analysis by two-dimensional gel electrophoresis. Plant Physiol 81(3): 802-806. Wang, C. S., Walling, L. L., Eckard, K. J. and Lord, E. M. (1992). Patterns of protein accumulation in developing anthers of Lilium longiflorum correlate with histological events. Am J Bot. 118-127. Yang, C. Y., Chen, Y. C., Jauh, G. Y. and Wang, C. S. (2005). A Lily ASR protein involves abscisic acid signaling and confers drought and salt resistance in Arabidopsis. Plant Physiol 139(2): 836-846. How to cite: Chen, Y., Hsiao, Y. and Wang, C. (2015). Phenol-based Total Protein Extraction from Lily Plant Tissues. Bio-protocol 5(4): e1399. DOI: 10.21769/BioProtoc.1399.